Basically, you get to play as a teenage monster (with a choice of vampire, werewolves, ghosts, and many more) battling horror and intrigue and… pimples? Possibly. There’s a big focus on relationships, group dynamics, the power people can (intentionally and unintentionally) have over one another. It’s also very intentionally queer (which, yay!). It’s very melodramatic in tone, but in a good way (I say as someone who’s generally not big on melodrama). I haven’t played this game myself yet, because I only really found out about it… like, today. Rather, I heard about it last week and decided to look it up properly today and dang! I have watched about 6 hours of people playing it on YouTube this afternoon/evening and it’s so good! I really want to play in a one-shot or something during the winter hols, but I don’t know if I’ll have time. I might wait until the second edition, which just had what appears to have been a very successful Kickstarter, is out next year to pick it up. 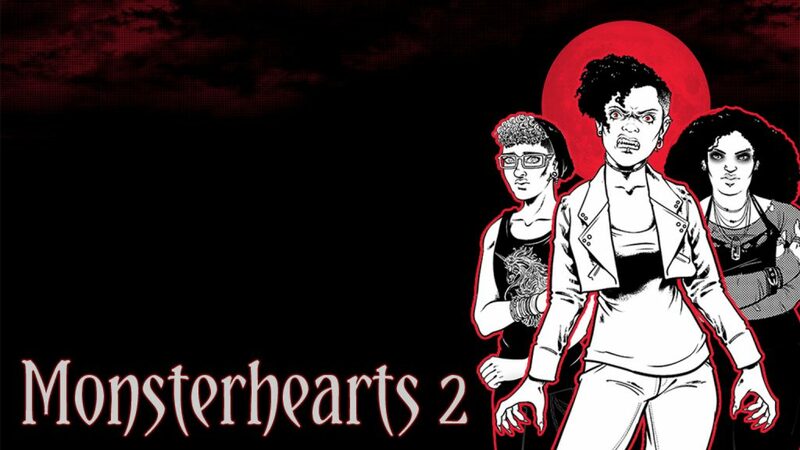 Monsterhearts is created by Avery Alder, a queer trans game creator. It’s just one of several games she’s made, so you should totally check her website out! If you wanna watch the game in action, I recommend this Missclicks One-shot and this Roll 20 One-shot. They’re both super fun and give a good idea of what the game is like. Check out my regular advent calendar post for the day. It’s about glögg. This entry was posted in Adventboost and tagged adventboost, adventboost 2016, monsterhearts, rpg, signal boosting, tabletop rpgs by Emma Lindhagen. Bookmark the permalink.